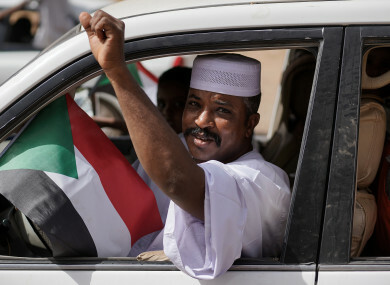 A Sudanese man celebrating the fall of the Bashir regime. AFTER THREE DECADES in power, Sudan’s president Omar-al-Bashir was ousted yesterday following months of protests by the country’s citizens. Speaking on State television yesterday, Defence Minister Awad Ibnouf announced Bashir had been removed from power and detained by the army. Hundreds of people took to the streets in central Atbara and other Sudanese cities on 19 December to protest the tripling of bread prices. Some chanted “No to hunger” and in Atbara they set fire to the headquarters of Bashir’s National Congress Party (NCP). After this the protests became less regular but on 6 April thousands again marched in Khartoum, gathering for the first time outside the military headquarters chanting “One army, one people”. However activists are demanding that power be handed to a civilian government. Protesters have defied a night-time curfew and dismissed the military council that took over as “the same old faces” from Bashir’s regime. Most shops and offices closed today, as Friday is a day of prayer and rest in Sudan. But large crowds are expected to throng into the streets of Kartoum and its twin city Odurman after noon prayers. Email “Explainer: What's happening in Sudan?”. Feedback on “Explainer: What's happening in Sudan?”.